Summary: Thrips are the most consistent and predictable group of insect pests requiring attention annually in cotton, with tobacco thrips, Frankliniella fusca, as the most common and important species infesting the crop in the vulnerable seedling stage. Recognizing the risk factors that promote thrips development and injury and understanding the various strategies for managing these pests are critical to getting a young cotton crop off to a good start. 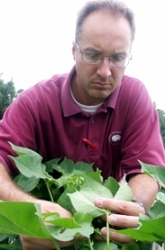 This presentation will help consultants, county agents, growers, and other practitioners in the Southern U.S. cotton-producing states to understand more about certain conditions that encourage problems with thrips and how to minimize early season stress on young cotton and apply effective control strategies. In this presentation, practitioners will become familiar with the risk factors for developing problems with thrips, how reduced tillage and residue from cover crops can reduce populations of thrips, how starter fertilizer can boost crop growth and help cotton “outrun” damage caused by thrips, what to expect from at-plant and post-plant options for chemical control of thrips, and how herbicide injury can jeopardize the effectiveness of insect control tactics. By the end of this presentation, the practitioner should know more about minimizing early season stress on cotton seedlings by controlling thrips effectively and getting the crop off to a good start.